This is a joint giveaway with EarthMamasWorld and Natural Parents Network. You may enter at one site only. Please find the section marked “Win it!” for the mandatory entry and optional bonus entries. Wishbone Design Studio is offering our readers a giveaway for an Apple-A-Day 3 in 1 Limited Edition Bike, a value of $249.00. Wishbone Bikes are the most eco-friendly bikes on the market with their lightweight frames. The frame is made from preservative-free, plantation birch and ash with organic cotton. They are bonded and finished with eco-friendly products. Their rubber tires are created from sustainably managed woods, and the wheels are made with 60% post-consumer recycled plastic. 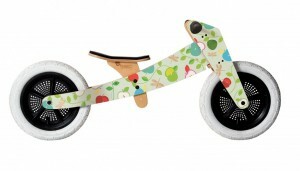 The Apple-A-Day bike is an amazing wooden balance bike that transforms and grows with your child. This bike is a 3 in 1 that grows with your child from ages 1 to 5. 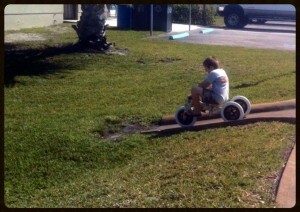 At the age of 1, long before a child can normally use a balance bike, they can use this as a trike. As confidence grows the third wheel is removable and the trike converts to a low frame balance bike. When the child has further grown, the wishbone frame is flipped and it becomes one of the largest running bikes on the market. We were all so excited when our Wishbone Apple-A-Day bike was delivered to our front door. 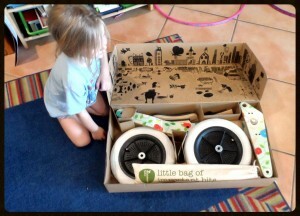 When we opened the package my children were excited to see the art on the inside of the box (the bike box and printed material inside are recycled and printed with non-toxic inks). The box kept my 2 girls busy while my 7-year-old and I assembled the balance bike. I was pleasantly surprised with the ease of assembly, we had it totally assembled in about 20 minutes. This bike is absolutely beautiful, it features artwork from Coralie Bickford-Smith. This Wishbone Bike wants to inspire healthy eating and encourage kids to be physically active. It certainly inspired my children who immediately began zooming all around our home on their new balance bike! The bike is very lightweight, 12 pounds as a trike and 8 pounds as a bike, so I was able to easily load it in our vehicle and take it to a park. Ava, 4 years old, enjoyed the first outdoor ride on the trike. 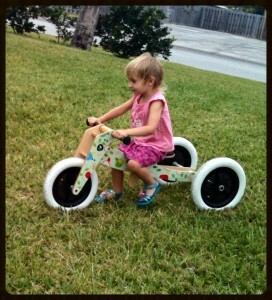 Audrey, 2 years old, was able to really pick up speed on the trike! She enjoyed cruising all along the bike paths throughout the park. I know that the suggested age range is 1 to 5, but Alex, 7 years old, really wanted a turn. Audrey passed the trike to her brother and he immediately headed off-road! I was very impressed with the durability of the trike. When we arrived home from the park, the kids were not ready to stop riding. We headed to a big hill on our street and enjoyed a few races. As you can see, this bike is sturdy and tough. I was even comfortable with Audrey riding down the hill on the trike. Getting ready to go down . . . 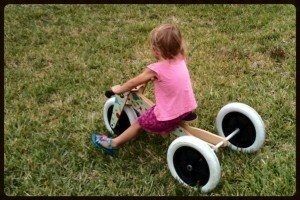 I kept the Wishbone bike as a trike for about a week then decided to convert it to a balance bike. I skipped the middle stage and decided to flip the frame over for the larger balance bike since Ava is 4 years old. I had to totally disassemble and reassemble the bike because I was flipping the frame, the entire process took about 30 minutes and was rather easy due to the detailed instructions provided with the bike. I was very grateful for the ‘little bag of important bits’ that was included, I was able to store the instructions and spare parts safely together. Ava has never been on a balance bike before. Alex learned to ride a bike on one so he hopped on to show her how to ride. 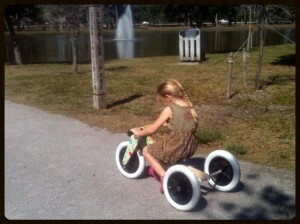 She was a fast learner and was riding on the two-wheel balance bike in no time! 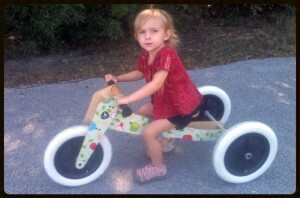 After riding on the balance bike for a few days Ava has gained such confidence in her riding ability. She no longer wants to ride on her bike with training wheels as she can get around much faster and with more ease on the balance bike. The way that she is progressing she will never need her training wheels again! I am so impressed with the Wishbone Apple-A-Day Limited Edition bike and certainly recommend it. It is a very sturdy and eco-friendly 3 in 1 bike. My only regret is not getting this bike sooner, and my only dilemma is whether to keep it as a balance bike for Ava, a trike for Audrey, or purchase one so they are both able to enjoy a Wishbone bike together! Once a child begins walking this is the only bike that they would need for many years. You can also purchase many cool accessories for your bike from Wishbone Design Studio such as stickers and seat covers. Wishbone also offers a 2 in 1 bike if you do not need the 3 wheel trike feature and a super cool Flip Ride-On that is a rocker and a ride on. And just for NPN readers for a limited time, use coupon code appleless20 to receive a percentage off your purchase. This coupon code is only good from June 8 through June 15, 2013. For your own chance to win an Apple-A-Day 3 in 1 Limited Edition Bike from Wishbone Design Studio, enter by leaving a comment and using our Rafflecopter system below. 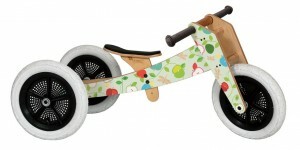 The winner will receive an Apple-A-Day 3 in 1 Limited Edition Bike from Wishbone Design Studio. MANDATORY ENTRY: Leave your name and email address in the Rafflecopter entry system. Leave a valid email address so we can contact you if you win. Email addresses in Rafflecopter are not made publicly visible. This is a joint giveaway with Earth Mama’s World and Natural Parents Network. You may enter at one site only, and we’ll be recording IP addresses to ensure that there are no duplicate entries. That said, please do visit and enjoy both sites! Contest closes June 22, 2013 at 11:59 p.m. Eastern Time. 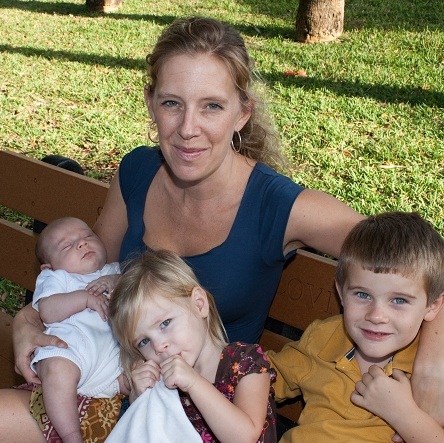 Angela is an attachment parenting, gentle disciplining mama attempting to live a natural life. She has one son, two daughters, and two step daughters. 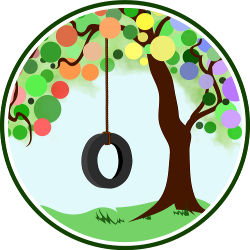 You can find her online at Earth Mamas World where she writes about her homeschooling/unschooling adventures, sensory play, chemical free alternatives to daily living, homeopathic remedies, parenting naturally, sharing recipes, and so much more! also love the wishbone flip! my little one would love that! Oh, I would love this for my little guy! What a neat bike! The flip looks super fun, too. the Wishbone Flip looks like so much fun. My 20month old would totally love these toys. This would be perfect for my toddler son! The nameplate looks really cool, too. This looks very cool can wait for my kids to try it out. the wishbone flip is so cute too! I like the wishbone flip! I love the nameplate! And the seat covers are super cute too! This would be for my super cute 4yo daughter who loves bikes! Love the bike & accessories! This would be the perfect gift for my daughter’s upcoming first birthday…a gift that will continue to grow with her! The Wishbone Flip looks like a clever toy that any toddler would love! 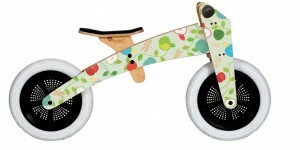 My son would love the Apple-A-Day 3 in 1 Limited Edition Bike. We took him to a bike shop this past week and he was very sad to leave without one for himself. He know calls out “bike” every time he sees one when we are out and about.